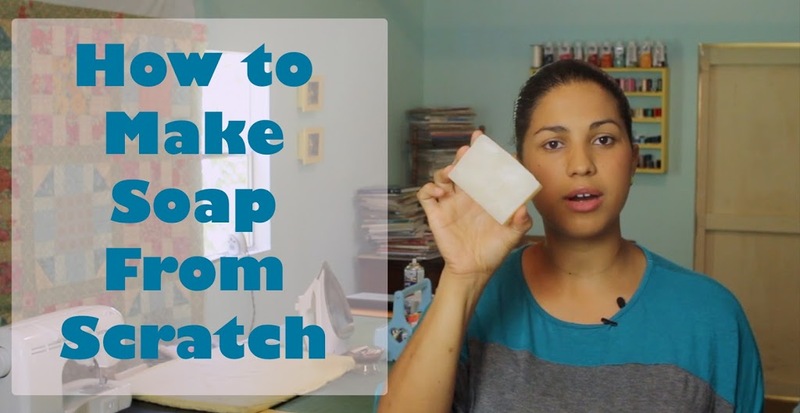 Many of you may have seen my first soapmaking tutorial I posted a few years ago. Well, since then I’ve received a ton of requests for another tutorial where I share my go-to recipe. You’ve asked and here it is! 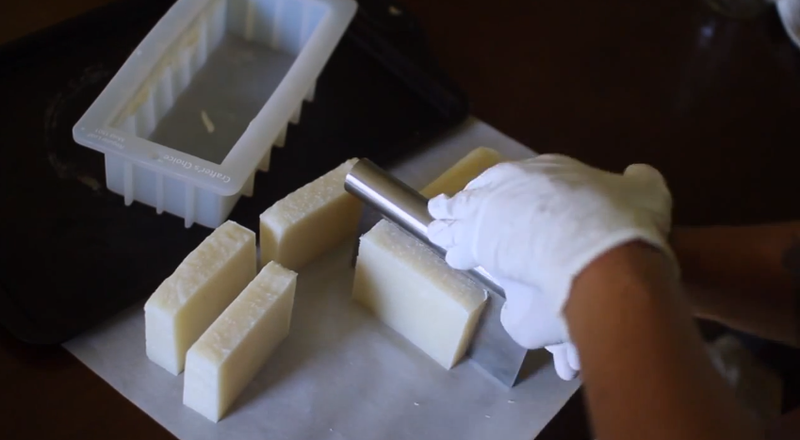 In this video I teach you how I make a simple and all natural soap batch. I didn’t add any colorants or fragrances to this batch to keep it as simple as possible. 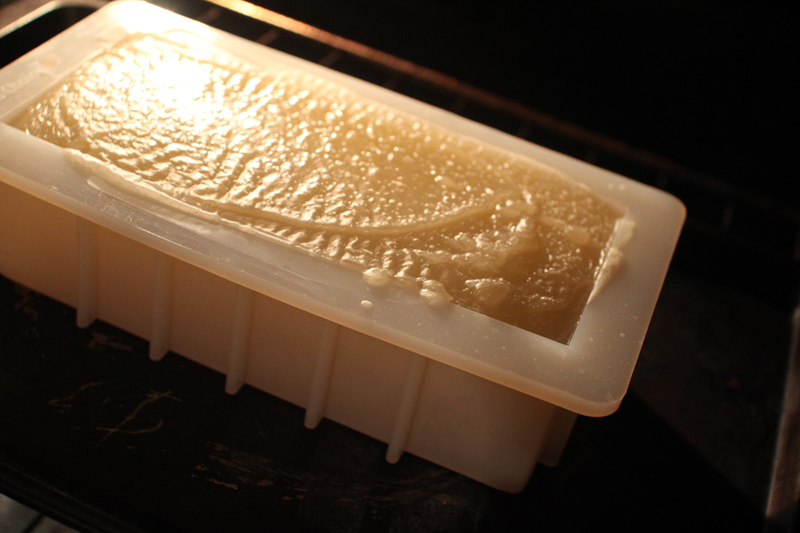 There are tons of different methods for making soap and over the years I have decided that this way works best for me because it’s quick, easy and I don’t need to measure any temperatures. Technically the method I show in this video would probably be called Room Temperature/Oven Processed soapmaking. 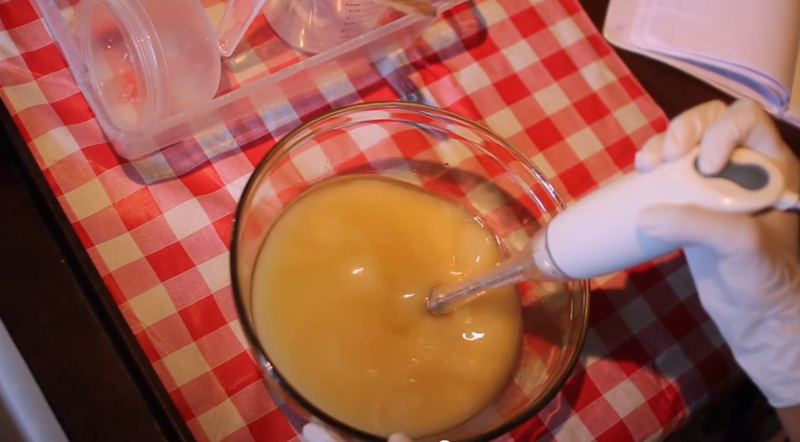 Emulsifying batter to reach trace. I use four oils that can be easily found in your local grocery store or health food store- olive oil, coocnut oil, castor oil and sweet almond oil. Aside from that you just need some distilled water and lye (must be 100% sodium hydroxide). Get your soapmaking supplies HERE. If you’re familiar with cold process soapmaking then you’ve probably heard about “gel phase.” In this video I show you how I use my oven to make the soap go through a full gel phase. You can see the soap going through gel phase in the pic below. It’s when the entire soap batch looks translucent. This starts in the center of the loaf and will work it’s way to the outside edges if kept hot (or insulated) enough. If you’re new to soapmaking I definitely recommend you do some a lot of research before trying your first batch. Especially as it relates to soaping safety. The lye water solution I use for this batch is water discounted- meaning it is a highly concentrated solution and you definitely don’t want to spill or splash it anywhere. Once you have the safety part down the rest is soapy fun! Watch me cut the soap bars. Amazing lather that is not drying on the skin! How to Make a Pillow Sham & Giveaway! Do you receive compensation on the items that you recommend on Amazon and such? Or are these suggestions from personal experience. Do you inform your readers when you receive compensation of an item(s) you suggest so that we may know it is an unbiased suggestion? If I added some pandan leaves will it change and not become a soap anymore ??? What are your measurements by Oz that you use to make them?